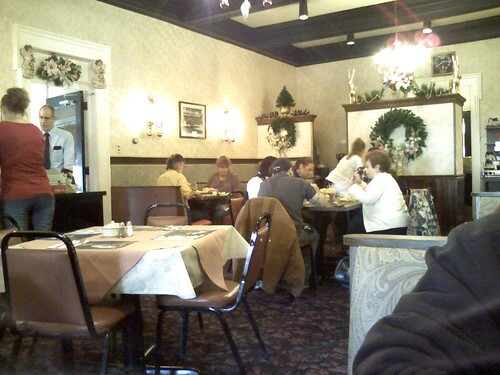 Breakfast was at Freeman’s Family Restaurant and Catering on the edge of downtown Charleston. It was a great little diner where everyone seemed to know everyone else (except, of course, for us). It was kind of an interesting neighborhood too. After breakfact, we headed through Morgantown WV (which will, I think, require further study at a later date) toward Charelroi PA, where Mark’s dad was born. We’d visited Charleroi before, back in 2004, and thought it was sort of cool little town. In fact, the thought of buying a really cheap vacation home there had occurred to us (Mark fantasized about owning the old family homestead) and one of the goals of the trip was to spend a little more time there. And it was fun. We had lunch in an ancient hotel restaurant called Rego’s, which got me all warm and squishy amid the old people and their salads and soup. WE actually spent several hours in Charleroi, looking at houses and trying desperately to find postcards and stamps. And then there was the library. Mark had planned to do some research there, using old city drirectories and maybe newspapers. Alas, this was not to be. Upon entering, we made the mistake of asking the reference librarian (OK, the only librarian) for help, and were told flat out that “nobody keeps stuff like that anymore because it’s all on the computer” and that the only people who might be able to help us were members of the historical society, who were only there one day a month or something. This woman was horrid. It wasn’t that she was rude, per se. She was just unwilling to help in any way. And she didn’t know what she was talking about; I’m pretty certain that Charleroi’s old city directories haven’t been digitized yet (and even so, wouldn’t the library be the one doing it?) and such items, as well as newspapers on microfilm, are available in most public libraries I’ve visted, no matter how small. As a library school student, I was appalled by her demeanor and her complete ignorance. Plus, she pretty much shat all over one of Mark’s primary reasons for visting the town. 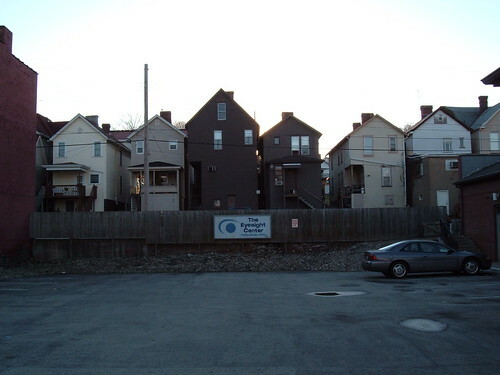 After Charleroi, we continued up the back road to Pittsburgh through the Monongahela valley. By the time we arrived, we settled for a trip to Giant Eagle and some Chinese takeout before bed. So sorry that you were not treated well in Charleroi – yes, we have old directories and other information that might be able to help you. Contact the CAHS, Inc. 724-483-2030 and leave a message and someone will get back to you.